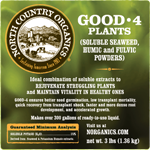 GOOD-4 PLANTS has the ideal combination of soluble seaweed, humic, and fulvic extracts to rejuvenate struggling plants and maintain vitality in healthy ones. GOOD-4 ensures better seed germination, low transplant mortality, quick recovery from transplant shock, faster and more dense root development, and accelerated growth. GOOD-4 Compost Tea has the ideal combination of soluble seaweed, humic, and fulvic extracts to accelerate both bacterial and fungal proliferation. Once introduced to the plant or soil, these extracts proffer secondary responses from both introduced (tea organisms) and indigenous soil flora and fauna. Residual extract helps sustain tea organisms on leaf surfaces for longer protection against pathogens. Subsequent applications of GOOD-4 Compost Tea can be made to extend survival and proliferation of both tea and indigenous organisms. Application: Add 3 oz weight (approximately 5/8 cup, volume) per 50 gallons of tea when brewing begins, another 3 oz mid-way through the brewing process, and another 3 oz near the end of the brewing cycle. For subsequent applications, mix ½ pound per 100 gallons of water and spray leaves to point of runoff 3-7 days after initial tea application. For best results dissolve powder in 1-2 gallons of warm water before adding to tank. Root growth is significantly improved whenever GOOD-4 Flowers is applied, whether as a foliar spray or applied to the soil which accelerates root absorption of plant nutrients. Increases of 2-3 times the root dry matter content is not unusual. This is especially significant for anyone propagating perennials. In all cases tested, the speed of germination and the percentage of flower seeds germinated were significantly increased whenever GOOD-4 Flowers was applied. GOOD-4 Flowers significantly improves the growth and development of all parts of a plant, from the roots to the blossoms. GOOD-4 Flowers inhibits senescence (aging). Inhibiting the rate at which flowers age has important implications including deeper coloration, and blossom longevity. The seaweed extract in GOOD-4 Flowers provides micronutrients essential to plants for the production of catalytic enzymes. These enzymes are critical in almost every function of a living plant from photosynthesis to reproduction. And the humic and fulvic extracts increase the plants’ ability to absorb these micronutrients. Micronutrients play an important role in developing vibrantly colored flowers. Application: For flowers, mix 1½ oz weight (approximately 5-level tablespoons) per 10 gallons of water and drench soil around each plant. NOTE: Avoid applications directly onto flowers as GOOD-4 Flowers may discolor petals. For best results dissolve powder in 1-2 gallons of warm water before adding to tank. Brix readings consistently show significantly increased sugar content of various fruits from the seaweed, humic, and fulvic extracts in GOOD-4 Fruit. GOOD-4 Fruit inhibits senescence (aging) of plants and their produce, which has incredible implications including greater production and increased propagation potential. GOOD-4 fruit also stimulates soil organisms that regulate nutrient allocation into plant roots. This biological regulation helps control the vascular concentration of dissolved nutrients which, when too high, can trigger insect attacks. Root growth is significantly improved whenever GOOD-4 Fruit is applied, whether as a foliar spray or applied to the soil, and roots absorb plant nutrients at an accelerated rate. Apples, Pears 1-lb Green tip(tight cluster) – Pre-bloom pink bud – Full bloom – Early fruit formation – Every 21 days until harvest. Strawberries (Annual and Perennial Crops) 1-lb Prior to transplant (Early spring growth for perennials) – At first bloom – At first fruit set – Every 3-4 weeks to mid-point in harvest season. In all cases tested, the speed of germination and the percentage of plant seeds germinated were significantly increased in planting cells where GOOD-4 Greenhouses was applied. GOOD-4 Greenhouses ensures low mortality, quick recovery from transplant shock, faster and more dense root development, and accelerated growth. Some tests show increases of 2-3 times the root dry matter content compared with untreated plants. Treated plants always perform better, even under extremely stressful conditions, than untreated plants. Tests show greatly enhanced resistance to stress from both external and internal physiological stress such as germination and flowering. The seaweed extract in GOOD-4 Greenhouses provides micronutrients essential to plants for the production of catalytic enzymes. These enzymes are critical in almost every function of a living plant from photosynthesis to reproduction. And its humic and fulvic extracts increase the plants’ ability to absorb these micronutrients. Application (Injection): For seedlings, mix 1-lb in one gallon of warm water, stir until completely dissolved and inject at a dilution rate of 100:1. For maintenance dilute at 150-250:1 and apply every 3-4 weeks or after periods of stress. GOOD-4 Transplants ensures low mortality, quick recovery from transplant shock, faster and more dense root development, and accelerated growth. Seaweed and humic extracts significantly improve the growth and development of all parts of a plant, from the roots to the flowers. Some tests show increases of 2-3 times the root dry matter content compared with untreated plants. Root growth is significantly improved whenever seaweed and humic extracts are applied, whether as a foliar spray or applied to the soil or rooting media. It has also been shown to accelerate root absorption of plant nutrients. Plants treated with GOOD-4 Transplants are less susceptible to environmental stress conditions. Treated plants always perform better, even under extremely stressful conditions, than untreated plants. Resistance to stress from drought, heat, and from internal physiological stress is greatly enhanced. In addition to all these benefits, GOOD-4 Transplants is biologically active and when introduced to the soil it stimulates the procreation of beneficial microorganisms. The result is accelerated growth, increased environmental resilience, intensified coloration, and healthier plants. Application: For Transplants, 1½-oz weight (approximately 5-level tablespoons) per 10 gallons of water and drench root mass before planting. Soak bare-root stock for 10-20 minutes before planting. For best results dissolve powder in 1-2 gallons of warm water before adding to tank. GOOD-4 Trees is especially formulated to rejuvenate struggling trees and to maintain vitality in healthy trees. Trees treated with seaweed, humic, and fulvic extracts are less susceptible to environmental stress conditions. Tests show greatly enhanced resistance to stress from drought, heat, and from internal and external physiological stress. Experiments have shown that these extracts significantly improve the growth and development of all parts of a tree, from the roots to the buds. Some tests show increases of 2-3 times the root dry matter content compared with untreated plants. Root growth is significantly improved whenever seaweed extracts are applied, whether as a foliar spray or applied to the soil. Humic and fulvic extracts accelerate root absorption of plant nutrients especially trace elements. A tree’s resilience to stress, positively affects its resistance to diseases and, through the proper allocation of nutrients throughout a healthy tree’s physical structure, plants are also more resistant to insect attack. Seaweed extract provides micronutrients essential to plants for the production of catalytic enzymes. These enzymes are critical in almost every function of a living plant from photosynthesis to reproduction. Humic and fulvic extracts increase the tree’s ability to absorb these micronutrients. In addition to all these benefits, GOOD-4 Trees is biologically active and when introduced to the soil it stimulates the proliferation of beneficial microorganisms. The results are accelerated growth, increased photosynthesis and chlorophyll production, intensified coloration, and significantly less need for pest and disease controls. Application: Mix 1-lb. per 100 gallons of water. Drench or inject inside, outside, and under the tree’s drip-line. Apply 25-75 gallons of mixture per 1000 ft2. To calculate ft2 of watering area, multiply the tree’s canopy diameter by 32 (e.g., 25 ft canopy diameter x 32 = 800 ft2). For best results dissolve powder in 1-2 gallons of warm water before adding to tank. GOOD-4 Turf greatly increases resistance to stress from drought, heat, and from internal and external physiological stress such as mowing, foot traffic, and wide temperature fluctuations; this is especially true for recreational turf. Root growth is significantly enhanced wherever and whenever GOOD-4 Turf is applied, whether as a foliar spray or applied to the soil. It also accelerates absorption of plant nutrients through the root systems. It is suggested that GOOD-4 Turf inhibits senescence (aging) of turf. Turf blades and roots typically slough every six weeks approximately. Inhibiting the rate at which grass ages has incredible implications including thicker stands, deeper coloration, and increased photosynthesis which ensures greater energy reserves in the root system. Extracts in GOOD-4 Turf decrease the dormancy period of most perennial grass plants. In all cases tested, the speed of germination and the percentage of turf seeds germinated were significantly increased whenever GOOD-4 Turf was applied. GOOD-4 Turf significant increases carbohydrate production which feeds root development and increases energy reserves — essential for turf’s survival through the hot, dry summer months. In addition to all these benefits, GOOD-4 Turf is biologically active and when introduced to the soil it stimulates the procreation of beneficial microorganisms. The result is sustained growth, biological allocation of mineral nutrients, intensified coloration, and significantly less need for pest and disease controls. Application: Mix 1-lb per 100 gallons of water. Start foliar applications at initial growth stage and continue at 3-4 week intervals. Make additional applications immediately after periods of stress or heavy use, to newly applied sod, and as a late season spray to help improve resistance to winter-kill and frost damage. For best results dissolve powder in 1-2 gallons of warm water before adding to tank. GOOD-4 Vegetables significantly improves the growth and development of all parts of a plant, from the roots to the flowers. Some tests show increases of 2-3 times the root dry matter content compared with untreated plants. Brix readings consistently show significantly higher sugar content of various vegetables from the seaweed, humic, and fulvic extracts in GOOD-4 Vegetables. Treated vegetables are consistently less susceptible to environmental stress conditions. Treated vegetable plants always perform better, even under extremely stressful conditions, than untreated plants. Tests show greatly enhanced resistance to stress from drought, heat, and from internal physiological stress such as germination and flowering. In all varieties tested, the speed of germination and the percentage of vegetable seeds germinated were significantly higher where GOOD-4 Vegetables was applied. GOOD-4 Vegetables also stimulates soil organisms that are able to allocate nutrients to plant roots at the ideal rate. This biological regulation helps control the vascular concentration of dissolved nutrients which, if too high, can trigger insect attacks. Tomatoes (processing varieties) At 6-8 in. growth – At pre-bloom – At fruit set – 14 days later.